Maria Snyder was selected in a global broadcast by the world’s largest science organizations as “A Role Model for Women and Girls in STEM: Solving the Problems”. 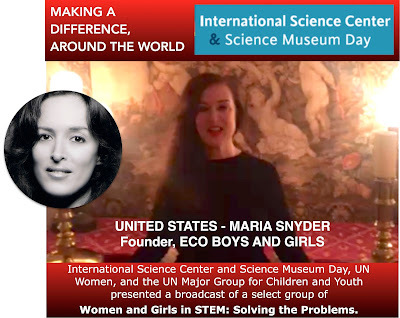 The Association of Science & Technology Centers, UNESCO, UN Women, UN Major Group for Children & Youth created the broadcast and marathon to promote International Science Center & Science Museum Day, a global event to highlight the importance of Science, Technology, Engineering and Math. 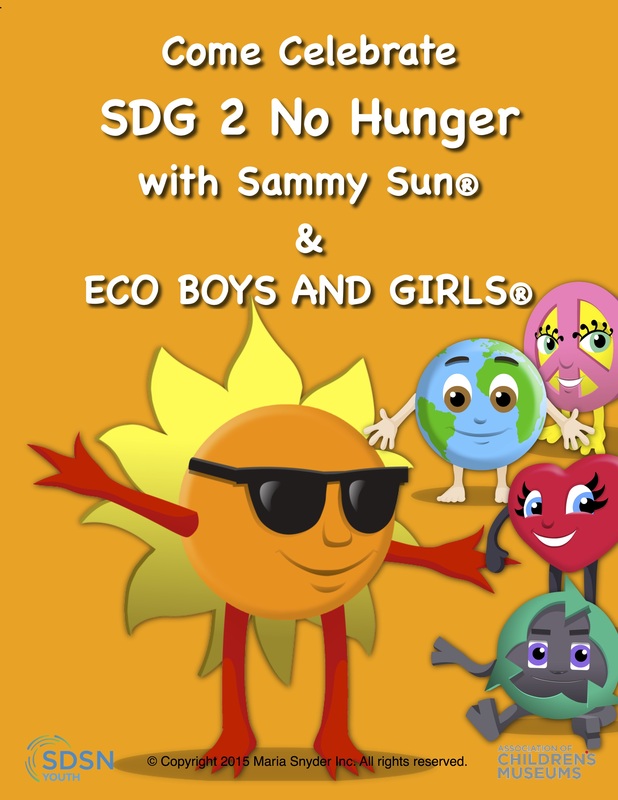 Ms. Snyder founded Eco Boys and Girls, an Early Childhood Development media brand, whose area of focus is educating and entertaining children around the world about Peace & Pluralism, SDGs and STEM. EBAG’s partners and program implementers are world leaders: Association of Children’s Museums, Association of Science & Technology Centers, Search for Common Ground, SDG Academy, Children’s Museum of New Hampshire. 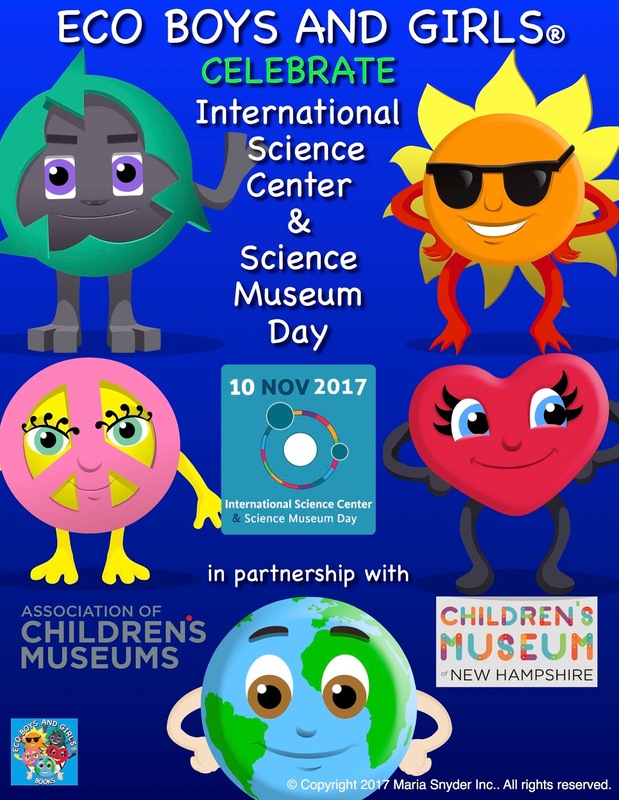 In celebration of International Science Center and Science Museum Day 2017, Eco Boys and Girls is celebrating with The Association of Children’s Museums and The Children’s Museum of New Hampshire. 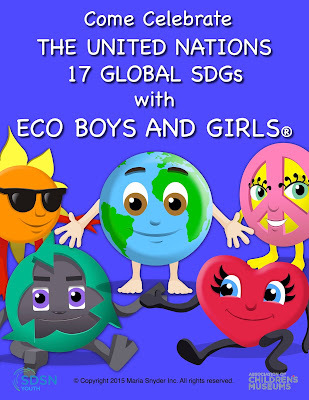 Eco Boys and Girls’ programming with The Association of Children’s Museums, based in Washington D.C., engages pre - and primary school age children in activity-based and self-driven learning about the 17 Sustainable Development Goals (SDGs). Through this program and in celebration of ISCSMD, young children are asked to think critically and curiously about the world around them and the role they play in making a positive difference. Eco Boys and Girls join with the Association of Science and Technology Centers to celebrate International Science Center and Science Museum Day 2017. 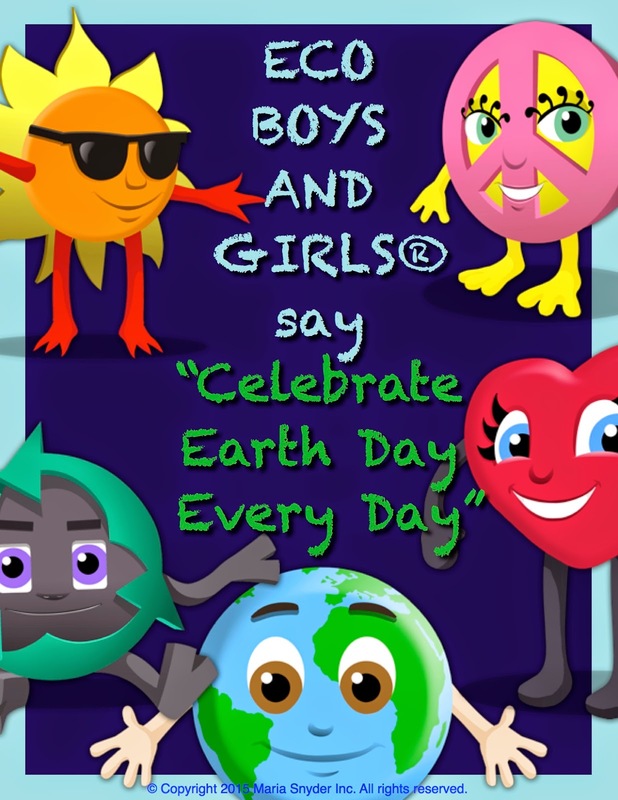 Eco Boys and Girls reaches young children across the globe with educational programming focused on early STEM, sustainable development and respect for diversity through pluralism. Eco Boys and Girls has made it their mission to deliver high quality, early learning in the areas where it is needed most for the future generation to succeed in our ever-connected, globalized world. To achieve this, Eco Boys and Girls delivers research-based curricula, media assets and materials, and hands-on activities. 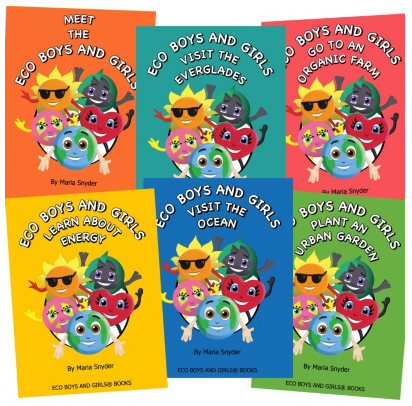 Driven by Eco Boys and Girls five characters, children are engaged in playful educational experiences through which they learn about their surroundings, taking care of the planet and each other. Eco Boys and Girls’ successes are in large part due to the high quality materials and designs that capture children’s attention, but also because programs are designed to stimulate children in a number of ways. The engagement of children in practical, educational activities across their familiar environments – home, school and community – means that important and lasting effects will take hold. It is through the Eco Boys and Girls’ approach of child-friendly and relevant learning experiences that early childhood education can include science, sustainable development and pluralism to prepare the youngest age group for the 21st Century. 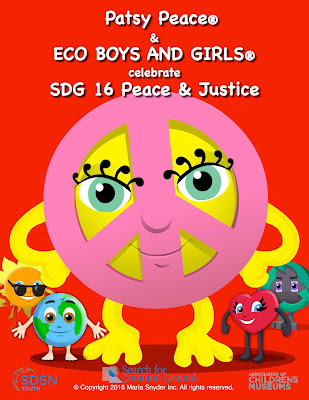 Search for Common Ground-Lebanon and US Embassy’s Rainbow of Hope are proud to partner with Eco Boys and Girls Peace & Justice Program to bring an engaging educational program to young children about the United Nations Sustainable Development Goal 16. Through this unique partnership, Eco Boys and Girls Peace & Justice Program emphasizes friendship, team work, sharing, and respect for one another and their surroundings. 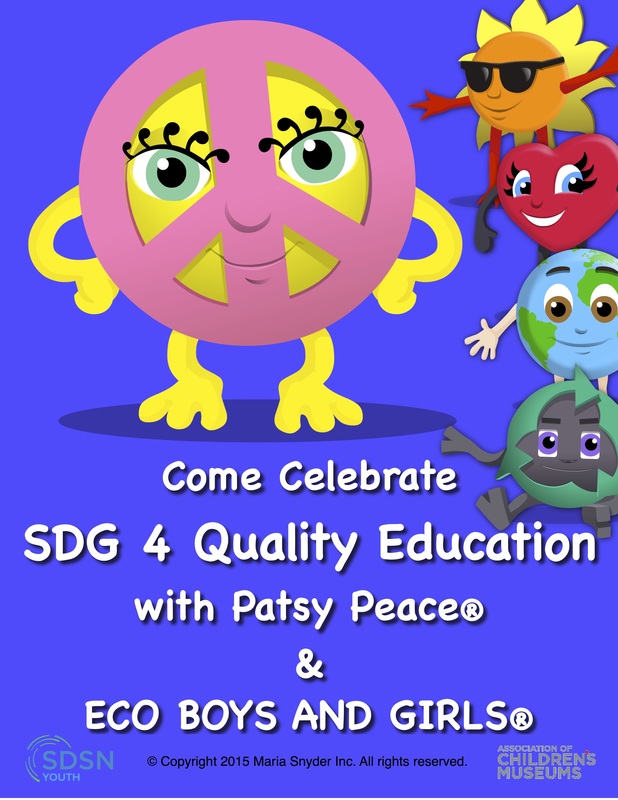 Eco Boys and Girls' Patsy Peace is featured, to speak "directly" to children about the values of peace, justice, and inclusion, with the hope to create a children’s sustainable development movement. By allowing children to build trustful and empathetic relationships, the program aims to reduce tensions and foster peace, while deliberately engaging their parents as well. Search for Common Ground's vision is a world without violence. Founded in 1982, SFCG's mission is to transform the way the world deals with conflict, away from adversarial approaches, toward cooperative solutions. SFCG has more than thirty years of experience in thirty-five countries around the world transforming social and interpersonal conflicts from destructive to constructive and engage in pragmatic long-term processes of conflict transformation. Eco Boys and Girls “Eco Building with Ray Recycle” and “Wind Power with Sammy Sun” are featured programs with the Children’s Museum of New Hampshire being shared with families in the new STEAM Innovation Lab. Parents are invited to take home simple instructions on how to recreate the fun at home with their kids. Eco Boys and Girls Science Bites will become a featured program in the STEAM Innovation Lab and scheduled along with a variety of drop-in challenges and projects every day the museum is open. 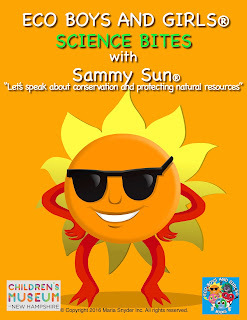 Museum educators will lead several Eco Boys and Girls Science Bites programs, including “Eco Building with Ray Recycle” and “Wind Power with Sammy Sun.” Each challenge encourages kids to look at materials that can be upcycled into something new, and also use engineering skills to construct something durable. 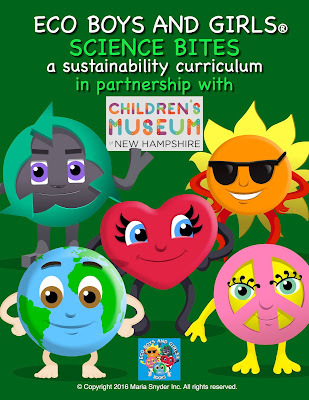 Earth Day, the Children’s Museum of New Hampshire introduces the ECO BOYS AND GIRLS SCIENCE BITES program. 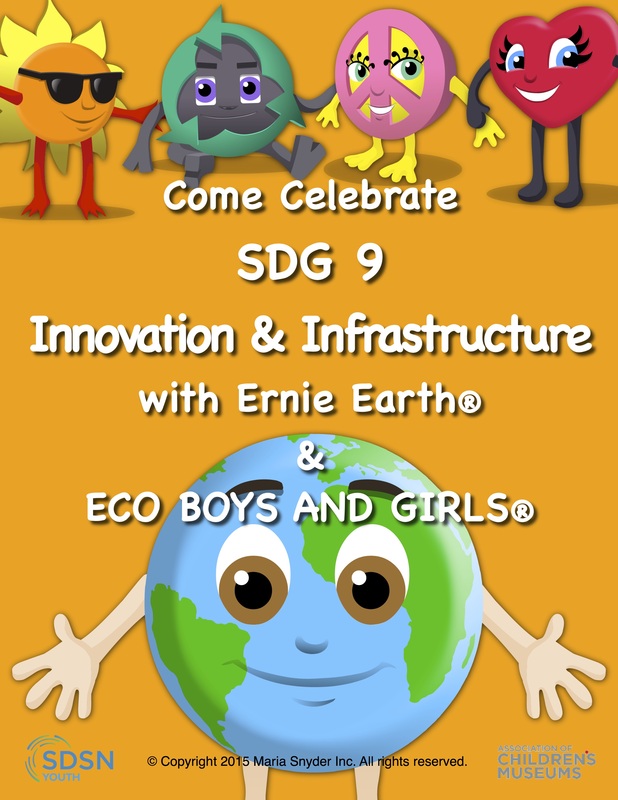 The Children’s Museum has partnered with Eco Boys and Girls to create a series of science demonstrations and activities, featuring the five lovable Eco Boys and Girls characters, each designed to educate pre-K to third grade children about the earth, sustainability and our interconnectedness. The Science Bites program at The Children’s Museum of New Hampshire takes these lovable characters and uses them to introduce environmental concepts in small “bite-sized” projects. For example, one Science Bite featuring Patsy Peace examines Osprey nests and encourages kids to engineer a mini Osprey platform on which these birds could build a nest. The activity uses materials such as masking tape, straws and craft sticks, and is designed so that parents can do it with their children at home, as well as at the museum. 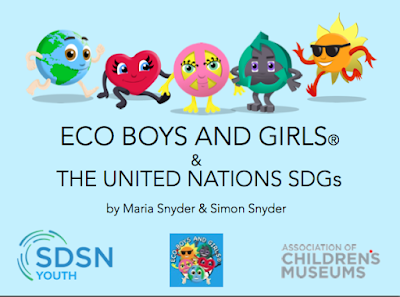 The Association of Children's Museums announces the Eco Boys and Girls & UN SDG’S Program as resources for Global Action for ACM’s worldwide network of museums. Through the Eco Boys and Girls & SDGs Program, ACM will engage young children through programming and direct outreach to build momentum around the new goals and create a movement that will empower communities to produce the most successful sustainable development movement in history. The Global Goals will be in effect from 2015 through 2030. The Association of Children's Museums is a Washington, D.C. based organization that represents more than 400 children's museums in 40 countries throughout the world. The association began in 1962 as the American Association of Youth Museums. The UN Sustainable Development Solutions Network Youth (SDSN-Y) event on "Youth for SDGs" celebrated the role of youth in shaping the post 2015 agenda and featured ECO BOYS AND GIRLS & SDG’s Program in Lerner Hall at Columbia University. 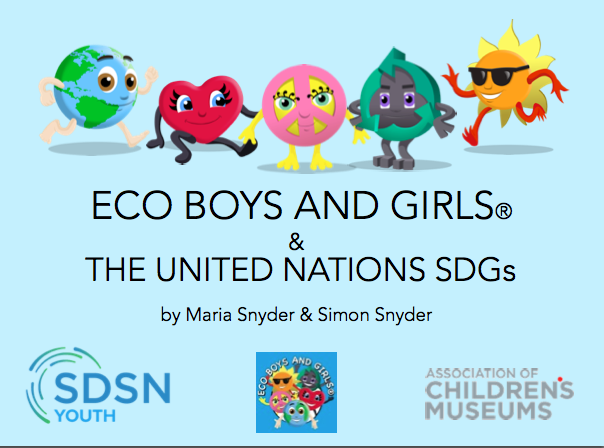 The Association of Children’s Museums' Executive Director, Laura Huerta Migus, announced the partnership with Eco Boys and Girls and SDSN-Y and the importance of how the role of youth participating in implementing the SDGs could affect change for the betterment of all. SDSN Y - The United Nations Sustainable Development Solutions Network (SDSN) launched its global youth initiative, SDSN Youth. The role of youth in the development discourse is a crucial game changer. SDSN Director Jeffrey Sachs urged youth leaders to work on practical solutions for sustainable development. ECO BOYS AND GIRLS in partnership with SUSTAINABLE DEVELOPMENT SOLUTIONS NETWORK-YOUTH have teamed up with the ASSOCIATION OF CHILDREN’S MUSEUMS (ACM) to launch ECO BOYS AND GIRLS & SDGs Program. 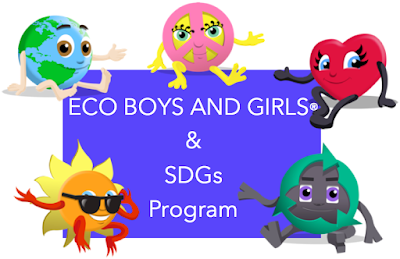 ECO BOYS AND GIRLS & SDGs Program through ACM will inform and invite children's museums, leaders, and educators to learn about the Sustainable Development Goals. ASSOCIATION OF CHILDREN’S MUSEUMS (ACM) is an international member service organization serving more than 300 children’s museums that serve more than 31 million children and families globally. ACM’s vision is to ensure all children and families have access to a high-quality children’s museum experiences. Children’s museums believe that all children have the right to play in environments designed for and by them. Eco Boys and Girls are official partners with SNSD-Y in the #KnowYourGoals Campaign, an initiative of the Sustainable Development Solutions Network-Youth. 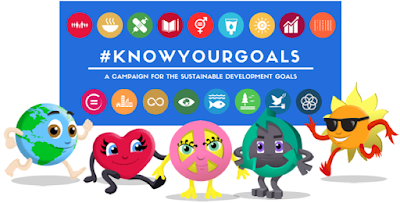 The #KnowYourGoals Campaign calls on all individuals, in particular youth, that have a right to know about the SDGs and how they affect their lives, communities, and the future of the planet. 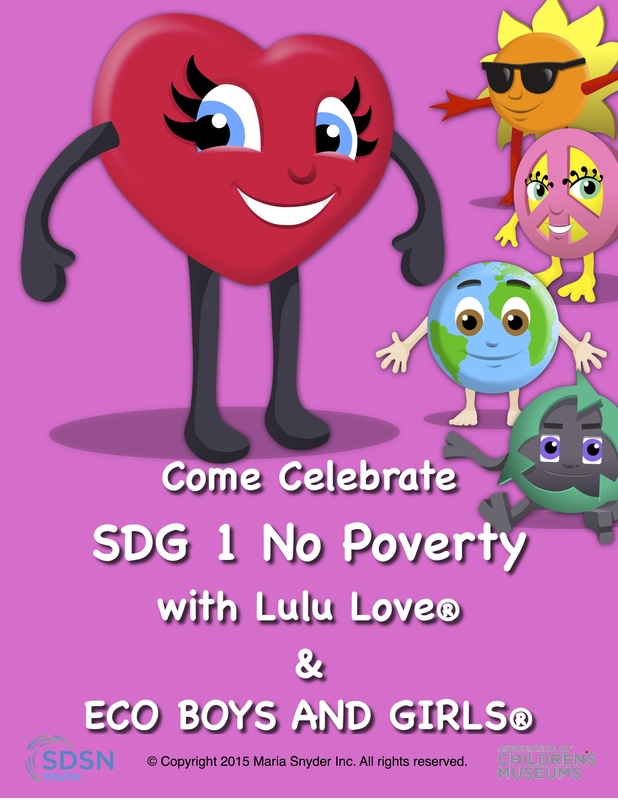 Eco Boys and Girls is proud to join in partnership with SDSN-Y, Oikos International, Project Everyone, Action/2015 and The World’s Largest Lesson. 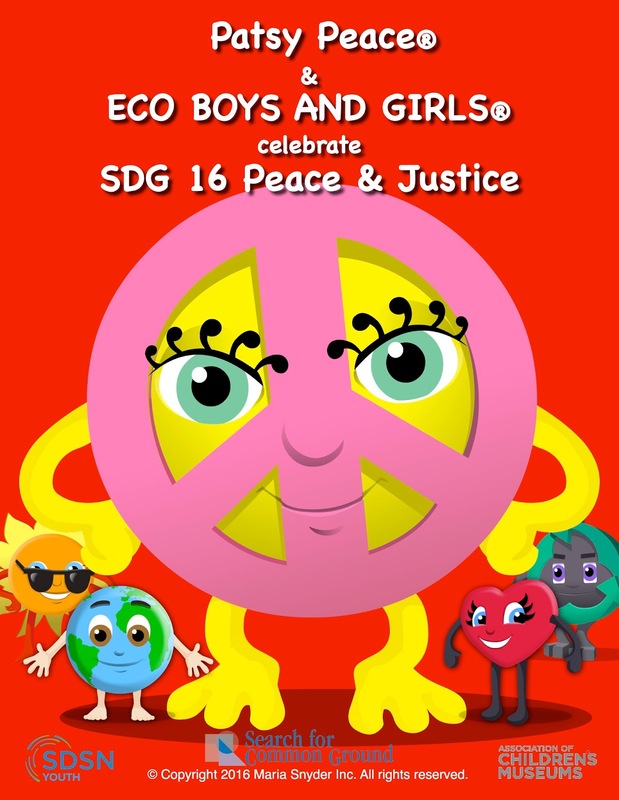 Sustainable Development Solutions Network-Youth partners with Eco Boys and Girls on their book promoting the 17 landmark Sustainable Development Goals. 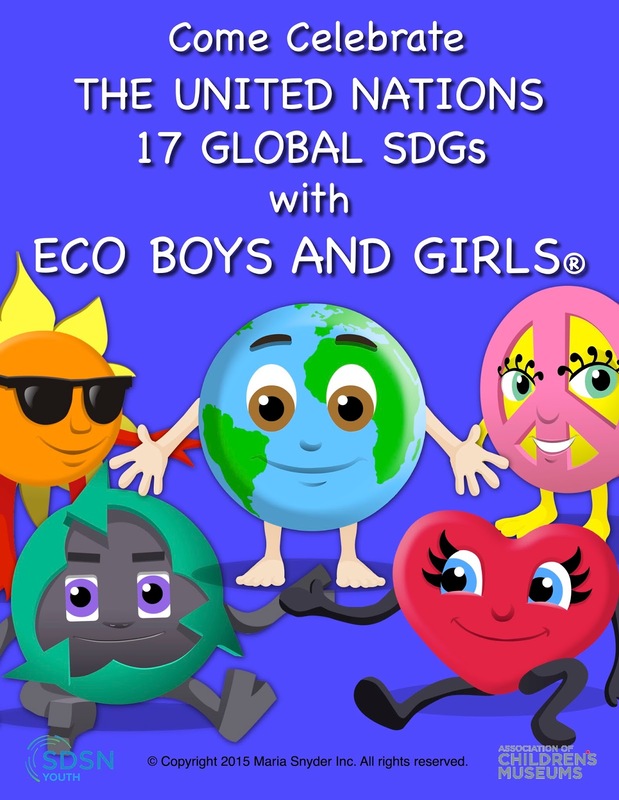 ECO BOYS AND GIRLS &THE UNITED NATIONS SDGs book will educate the younger generation of children about the global landmark SDGs, that are being adopted by the United Nations, and are in effect from 2015 through 2030. 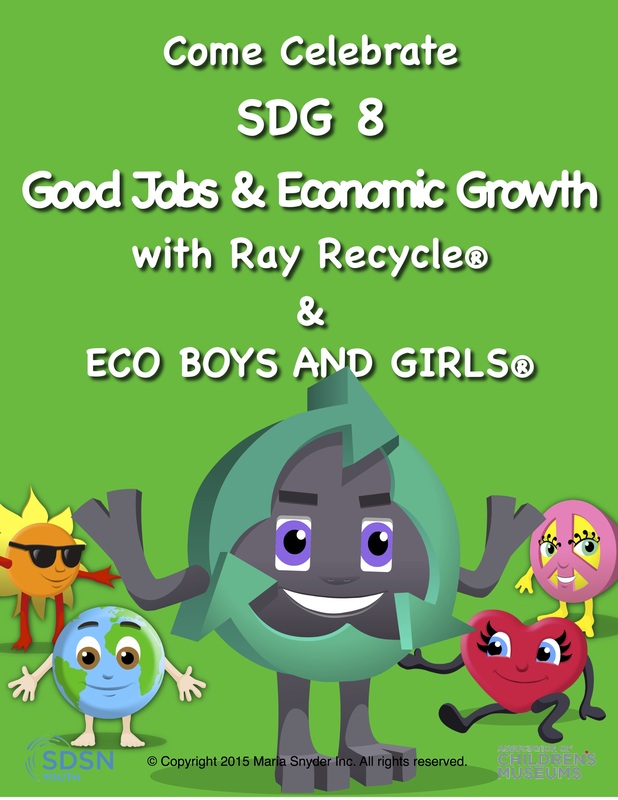 ECO BOYS AND GIRLS & THE UNITED NATIONS SDGs book engages the 5 Eco Boys and Girls animated characters: Ernie Earth, Lulu Love, Patsy Peace, Ray Recycle and Sammy Sun, to entertain young children, as well as educate them around these 17 goals. SDSN-Y (Sustainable Development Solutions Network-Youth) is an initiative of the Sustainable Development Solutions Network (SDSN). Through education and global cooperation, SDSN-Y encourages young people to prioritize the Sustainable Development Goals by creating a global platform to advocate for change and empowering youth to create sustainable solutions. Organised by the Permanent Missions of Sweden, Malaysia and Jordan, as well as IANYD Working Group on Youth and Peacebuilding and the United Network of Young Peacebuilders. Subjects focused on “young people’s positive contribution to peace and how they can play an active and valuable role as agents of positive and constructive change.” Presentation of the findings of the report by UNOY Peacebuilders on Agreed UN Language on Youth, Peace and Security and of the Guiding Principles on Young People’s Participation in Peacebuilding. "Maria Snyder debuted her characters, the Eco Boys and Girls at the Liberty Science Center. Snyder, an activist, artist and model, developed Ernie Earth, Lulu Love, Patsy Peace, Ray Recycle and Sammy Sun because she wanted to use her art background to motivate positive change. 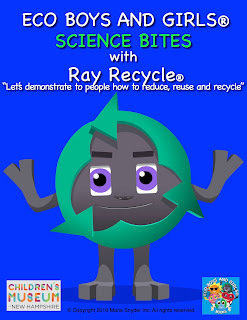 Seeing the response to the characters at the Liberty Center and elsewhere, Snyder created the series of children’s titles starring the Eco Boys and Girls." Snyder says "Children today seem to be aware the water is dirty, the air is polluted and the animals are in peril. They are learning that our planet is in crisis and they want to help – to take care of the animals, to take care of each other and our earth." ECO BOYS AND GIRLS BOOKS, a series of 6 books focusing on STEM and environmental education is reviewed at the National Wildlife Federation. 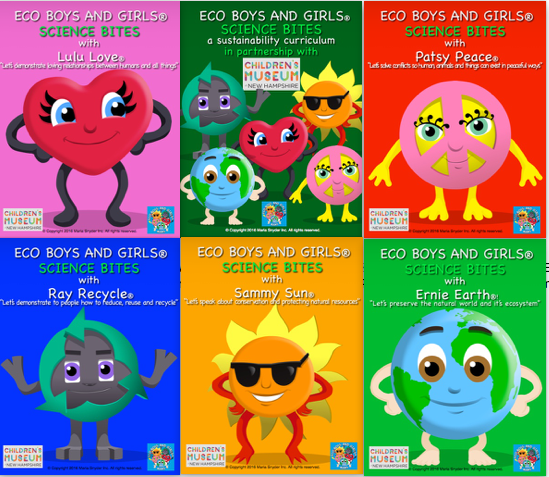 The ECO BOYS AND GIRLS book series is recommended for Pre K to 3rd Graders by the NWF. 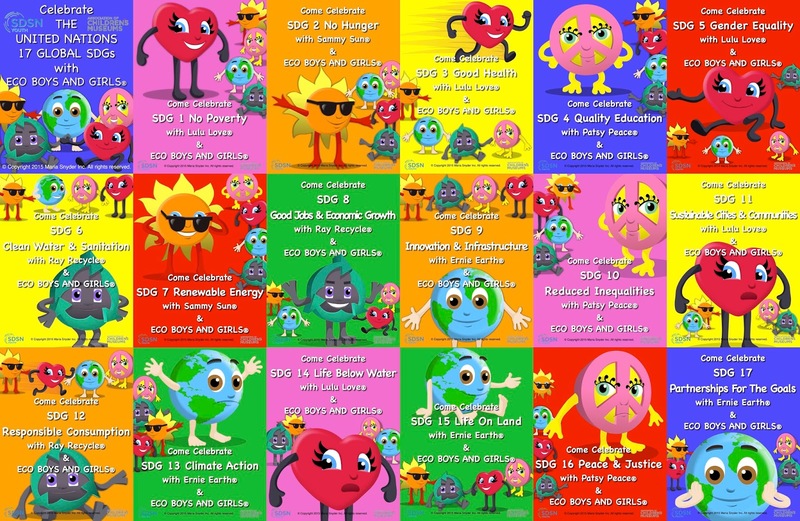 The series focuses on messages of sustainability and interconnectedness for young children to inspire a better world for all. The NWF states: "The greatest challenge in providing education for young children is how to have an artful balance of informative lessons and entertaining pictures and stories that capture a child’s mind and heart. 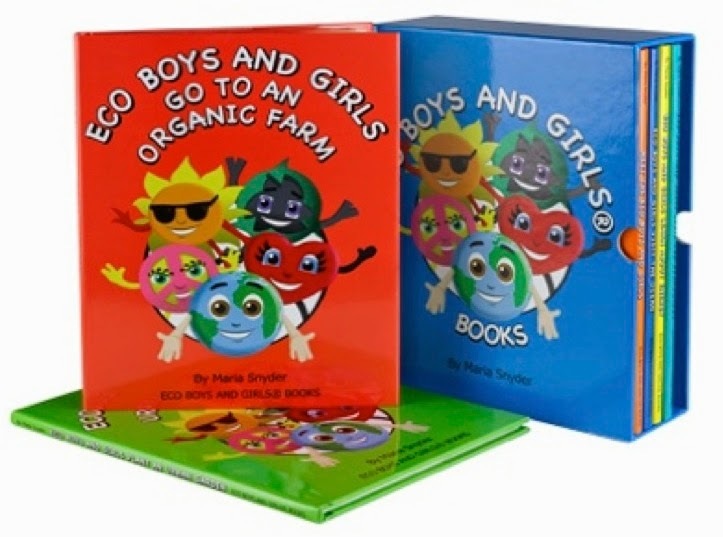 The new Eco Boys and Girls book series by artist, eco-entrepreneur and author, Maria Snyder accomplishes this blend beautifully. The series is especially captivating because it was developed for an age group that is often overlooked in environmental education – the very young." National Wildlife Federation is America’s largest conservation organization working to protect wildlife for our children’s future. ECO BOYS AND GIRLS BOOKS were unveiled at the NATIONAL EDUCATION ASSOCIATION'S Representative Assembly 2013 in Atlanta, Georgia, the nation's largest teacher and educators organization committed to advancing the cause of public education. The newly created 6 volume children’s book series focusing on environmental education was greeted by long lines at the Georgia World's Congress Center. 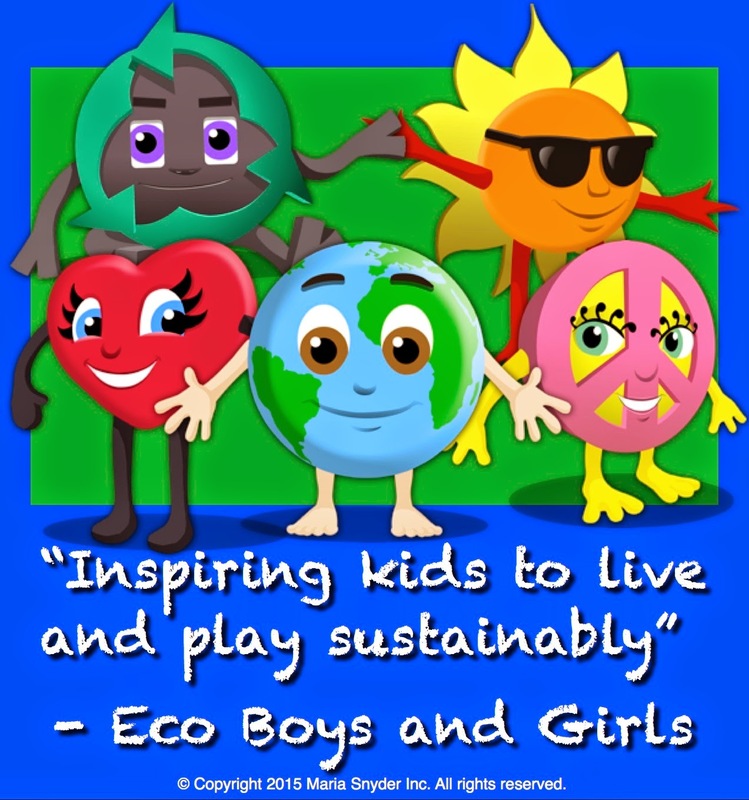 ECO BOYS AND GIRLS BOOKS mission is to engage youth and families to be aware of, involved with and connected to each other and the earth and to empower them to take ownership of our planet, learn about the environment and explore creative new ways to live in harmony. National Education Association's 3 million members work at every level of education from pre-school to university graduate programs. NEA’s Representative Assembly Annual Meeting has affiliate organizations in every state and in more than 14,000 communities across the United States. Various committees, constituencies, caucuses, leadership groups, and delegates attend across America. BROOKLYN CHILDREN’S MUSEUM welcomed ECO BOYS AND GIRLS to one of New York’s first green museums. The 5 characters were introduced with a short animated film, then a reading from the first book of the 6 volume book series, MEET THE ECO BOYS AND GIRLS. Interactive activities were featured and engaged children to “Take Action” and take care of the environment and each other. Each of the ECO BOYS AND GIRLS characters have their own mission: Ernie Earth preserves the natural world and its ecosystem; Lulu Love demonstrates the importance of loving herself, others and all things; Patsy Peace solves conflicts so that humans, animals and things can exist in peaceful ways; Ray Recycle shows people ways to reuse, reduce and recycle, and Sammy Sun spreads the word about conservation and protecting natural resources. Brooklyn Children's Museum was founded in 1899. A pioneer in education, it Is considered the first museum in the United States to cater specifically to children. In 2008, it became the first green museum in New York City. Copyright Maria Snyder Inc. Powered by Blogger.